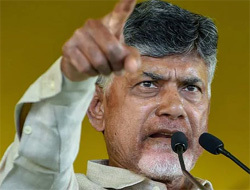 HYDERABAD: Telugu Dasam Party (TDP) chief and Andhra Pradesh Chief Minister N Chandrababu Naidu has said there is a "real possibility" of a repeat of 1996 in 2019 when the regional parties will form a 'Third Front' after the polls and form a Government. The Congress will be an "anchor party" and the decision on a Prime Minister will be chosen on the basis of the strength of seats. This he said on Tuesday in the background of a pre-poll 'mahagathbandhan' or grand alliance not becoming a reality. JD(S) leader HD Deve Gowda became the choice of a United Front(UF) Government of regional parties, and with the Left and the Congress supporting in 1996. No party had majority. The BJP emerged as the single largest party. "A repeat of 1996 in 2019 is a real possibility and this cannot be ruled out," Naidu told PTI in an interview. He said it is unlikely the BJP will cross the 200 mark. He saw a "growing negative wave" against the Modi Government. Andhra Pradesh goes to the polls in the first phase on April 11 to elect 175 Assembly and 25 Lok Sabha members. There are 3.93 voters. Naidu had parted ways with the BJP last year over the demand for special status for Andhra Pradesh. In 2014, Naidu in alliance with the BJP got 106 of the 175 Assembly seats. Of 25 Lok Sabha seats, the TDP won 16 and BJP 2. The YSRCP had got 68 Assembly seats and 7 MPs.